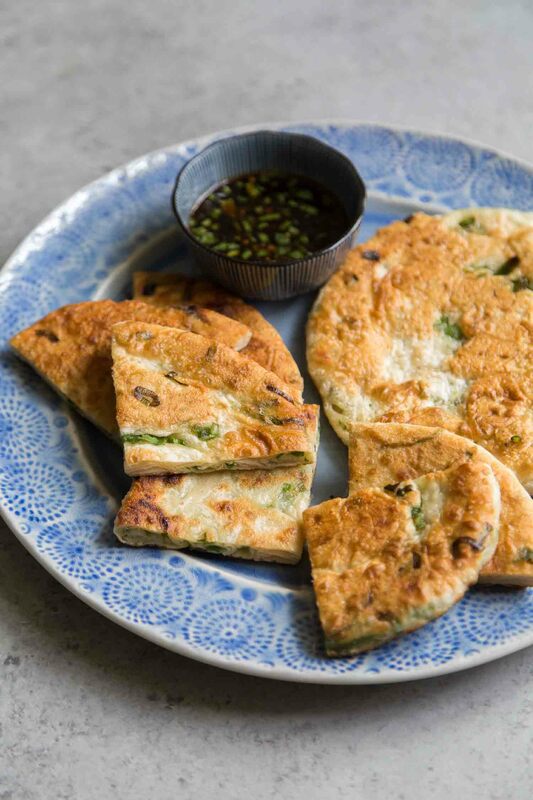 Green onion pancakes are a savory Chinese flatbread simply made with flour, water, salt, and chopped scallions. The unleavened dough is fried to a golden crisp and served hot. In honor of Chinese New Year, I made green onion pancakes (also known as scallion pancakes or cong you bing). Unlike the Gregorian calendar in which the new year always begins on January 1st, Chinese New Year falls on a different date each year because it is based on the lunar calendar. I love Chinese food, specifically Taiwanese food. I love the cuisine’s use of garlic and ginger. The food is fresh, full of flavor, and surprisingly easy to make. I was super excited to receive a copy of Hsiao-Ching Chou’s Chinese Soul Food. 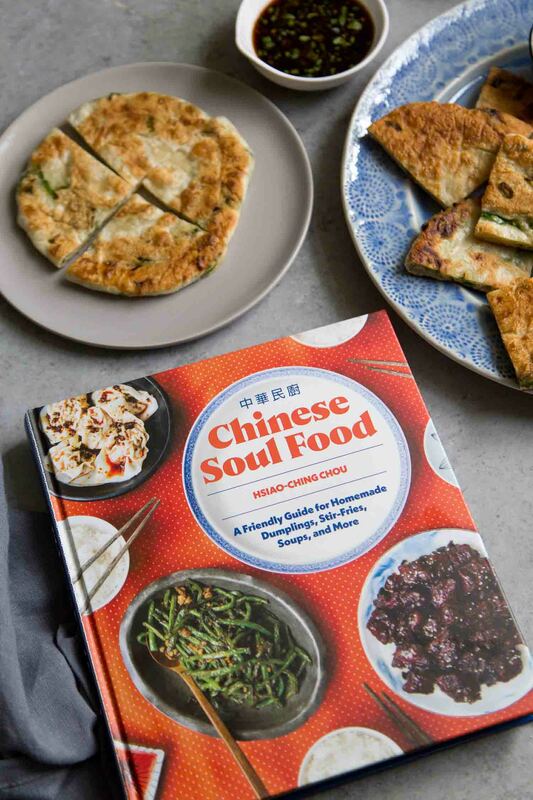 It’s a beautifully shot cookbook with a variety of recipes including my favorites: soup dumplings (xiao long bao), red-braised beef noodle soup, and three-cup chicken. Best of all, Chou shares all sorts of tips and tricks to make Chinese home-cooking more approachable. Afraid of working with doughs? Intimidated by frying? Have no fear! This unleavened savory flatbread is easy to make. The recipe for green onion pancakes is straight-forward, using simple ingredients you probably already have in the kitchen. From start to finish, it takes about half an hour to make. 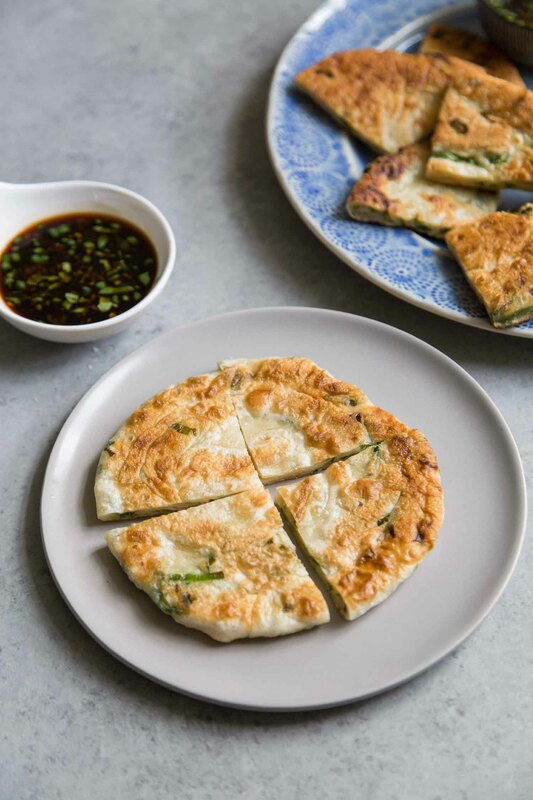 Enjoy the green onion pancakes with the accompanying soy-ginger dipping sauce, or eat it with braised beef noodle soup (my favorite way to enjoy it!). The dough is simply made by mixing together flour and water. It is kneaded by hand until it is smooth. The dough is allowed to rest for 20 minutes and then it divided into four equal parts. Working with one piece of dough at a time, it is rolled out thin. The surface of the dough is brushed with oil and sprinkled with salt and chopped green onions. Starting at one end, the dough is rolled into a tight log and then twisted into a tight coil. Finally, the round coil is flatten thin and then it is ready for frying! There are many variations of green onion pancakes depending on the region. Some are more chewy and bread-like while others are more crunchy and flakey. Try this one and then explore the others like this version which is cooked with a fried egg on top! Put flour in a large bowl. Add water. Using a rubber spatula, wooden spoon, pair of chopsticks, or your fingers, stir the water and flour together until a shaggy ball of dough starts to form. Use your hands to start kneading the dough and incorporating any remaining flour. The dough should feel slightly tacky but not damp. It should not stick to your fingers. Dust work surface with flour. Remove dough from bowl and knead for about 2 minutes. It should feel smooth. Cover dough with a damp towel or plastic wrap, and let it rest on the counter for 20 minutes. Divide dough into quarters. Roll a section out to about 8 1/2 inches in diameter. Brush a coating of oil on the dough. Sprinkle about 1/2 teaspoon salt across oiled dough. Sprinkle 2 to 3 tablespoons of green onions. Start from the bottom edge of the dough, roll dough tightly into a tube, then take one end and create a tightly wound coil. Tuck the end under the coil. Now, roll the coil flat until it's about 6 1/2 inches in diameter and 1/8 inch thick. Repeat with remaining sections of dough. Preheat an 8-inch skillet over medium-low heat for about 1 minute. Add 2 tablespoons of oil and heat for about 5 seconds, or until it starts to shimmer. Add a pancake and fry for 1 1/2 to 2 minutes, or until golden. Flip and repeat. Remove the pancake and set aside on a plate. Add 1 tablespoon of oil to the pan before cooking each of the remaining pancakes. Cut the pancakes into wedges and serve with dipping sauce. In a small bowl, combine soy sauce, vinegar, green onion, garlic, cilantro, ginger, and chili sauce. Set aside on the counter for at least 30 minutes, if possible, to let the flavors meld together. The longer the mixture rets, the more intense the flavors becomes. Store dipping sauce in a sealed container in the refrigerator for up to 1 week. In place of vegetable oil, I used grape seed oil. I prefer its neutral taste and high smoke point. Disclosure: I received a review copy of Chinese Soul Food from Sasquatch Books. All opinions expressed are entirely my own. 1. Mix boiling instead of warm water with the flour; this will greatly enhance the lamination of the dough. 2. 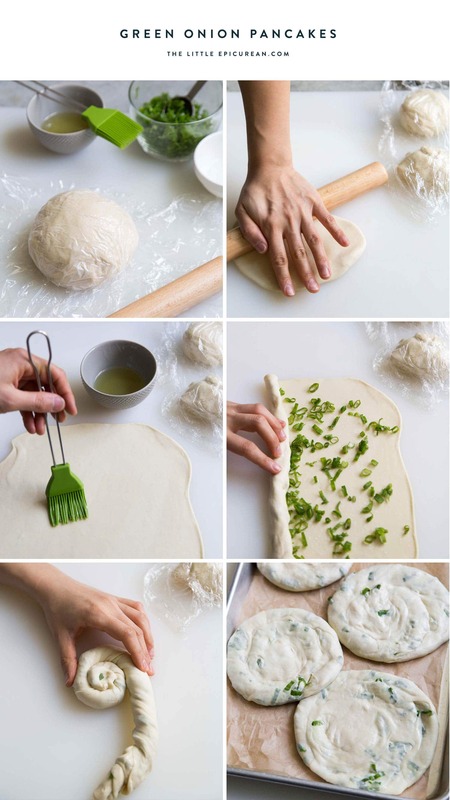 Brush each rolled-out quarter of dough with Chinese sesame oil before sprinkling the salt and green onions on dough;this adds a delicious savory element, and is traditional. 3. The recipe can easily be made in a mini- or regular food processor; good to know if you have arthritis. Scallion cakes are a wonderful treat, and kids love to help with the assembly. I’ve made it before with sesame oil and it really does kick up the flavors. For this post, I simply followed the recipe and techniques from the cookbook. But I appreciate you sharing your suggestions! LOOKS GOOD LOOKING FOR QUICHE, YEAVY GRAVY POT PIES, PULL APART BREAD, ALL BREAD, BUN, ROLL RECIPES NOT INTO SWEETS, SOUPS, STEWS, SEAFOOD AND LOTS OF IT WE LOVE TO COOK AND EAT HA MANY FRIENDS EAT HERE AND TAKE FOOD BACK TO THE HOSPITAL. WILL TRY OUT SOME OF YOUR RECIPES AND LET YOU KNOW. FRITTATA IS ANOTHER FAVOURITE.